Currently at $25 off a night! This deal ends when we get the new photos of the upgraded kitchen online! Book any dates now and save! The Hibiscus Suite at Sunset Serenade reopened after Irma and Maria renovation in February 2019. 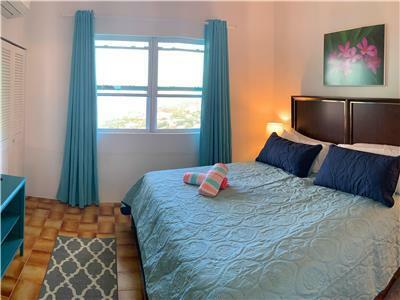 It is a spacious apartment suite with a large, air conditioned bedroom complete with a comfortable King size bed, a fully equipped kitchen, and a living space that includes a comfortable, pull out sofa. The Hibiscus Suite sleeps four comfortably, but the best part is its panoramic views of St. John, St. Thomas, and the surrounding cays. 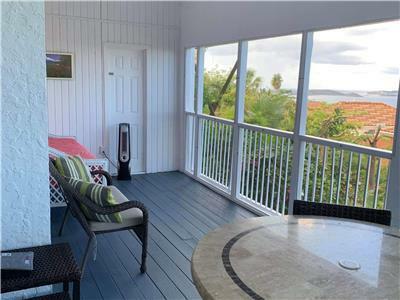 Enjoy your morning coffee outside on the large private deck while watching iguanas lounge in the trees below or simply watch the boats sail by. After enjoying a day at one of St. John’s famed beaches, head back to the Hibiscus Suite and enjoy a cocktail on the large, private deck as the sun dips down into the Caribbean Sea. When staying with us, you will have everything you need for an unforgettable vacation right at your fingertips. This includes coffee for your mornings, beach towels, beach chairs and a cooler for daytime fun, and comfortable outdoor furniture for you to lounge on while watching the Cruz Bay lights at night. Sunset Serenade has wifi throughout and a large parking area providing ample off-street parking to all guests. It also features an outdoor grill area that is shared between Sunset Serenade’s guests. The Hibiscus Suite at Sunset Serenade is a great choice for those looking for amazing daytime and sunset views, comfortable and chic accommodations and all the comforts of home, but without breaking the bank. We can almost guarantee that you’ll love our Hibiscus Suite so much, you’ll be booking your next trip before the ferry leaves the dock. Come see St. John while enjoying the comforts of home at the Hibiscus Suite at Sunset Serenade … we promise you’ll love it! Rates based on double occupancy. Additional guest fees apply. Click "Book Now" for detailed quote. We just returned from St. John and stayed in the Hibiscus Suite at Island Abodes. It is a delightful 1-bedroom/1-bath unit that sits on Bethany Hill overlooking Cruz Bay town and the Cruz Bay harbor. Large screened in balcony to keep the bugs away yet sit in the open air. Kitchen, sitting room, bedroom and bath are all roomy and very comfortable. Great walk-in shower, plenty of storage space in the bedroom and a well equipped kitchen. Besides a wonderful place to stay, you get Brittany and Robert, your delightful landlords. They do not live on site but are very accessible via phone or email. They are prompt to respond with info or solutions. 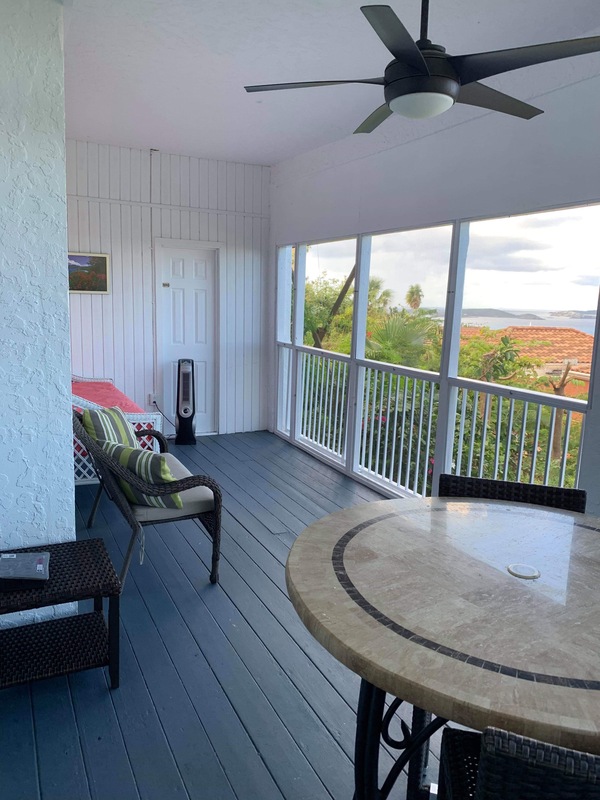 They do a terrific job of outfitting the property with everything that you need - beach cooler, towels & chairs, toiletries, kitchen utensils and loads of personal towels. We thoroughly enjoyed our stay at Island Abodes and will return soon! The view of Cruz Bay was fantastic! I recently returned from a 6-day stay at the Hibiscus Suite. Walking into the Hibiscus Suite, I could not help but walk straight through the kitchen onto the screened-in porch. The view of Cruz Bay was fantastic! We spent every night on the porch taking in the night-lights and sounds. The day bed on the porch was an added bonus! Everything about our stay was fantastic. Brittany provided a comprehensive information booklet, which gave detailed directions to the suite, information about parking, directions on how to use the TV and appliances, and even ways to prevent ants. Both check-in and check-out were super easy. Everything in the complex was clean and well maintained. It was nice to have shampoo, conditioner, sunscreen, and bug spray provided. This was my second stay with Island Abodes and I look forward to returning in the near future! This was my second stay with Island Abodes but this time at the Hibiscus Suite. Super convenient location just outside of town and easy to get to if you’re not a STJ pro just yet. Large and comfortable apartment with a super comfy king bed. Super clean and has everything you need. The screened outside area was an unexpected bonus. I spent most of my time in the outside living room. Every night brings the most gorgeous sunsets on island. Brittany and Robert and amazing and attentive hosts. I can’t recommend them or their properties highly enough. Thanks again for a great vacation! Walking into the Hibiscus Suite, I could not help but walk straight through the kitchen onto the screened-in porch. The view of Cruz Bay was fantastic! We spent every night on the porch taking in the night-lights and sounds. The day bed on the porch was an added bonus! Everything about our stay was fantastic. Brittany provided a comprehensive information booklet, which gave detailed directions to the suite, information about parking, directions on how to use the TV and appliances, and even ways to prevent ants. Both check-in and check-out were super easy. Everything in the complex was clean and well maintained. It was nice to have shampoo, conditioner, sunscreen, and bug spray provided. This was my second stay with Island Abodes and I look forward to returning in the near future! My husband and I spent 5 nights in the One Bedroom Suite at Serenade Suites. It was our first trip to St. John. We would definitely stay here again. The location was great. It's close to Cruz Bay, but not so close that you hear the noise from the restaurants and bars. We rented a car, so we never walked into town. It is close enough to do so, but it's a steep hike back up. The Suite was very clean and had everything we needed. The bed is very comfortable. There wasn't a great breeze when we were there (July) but the fans kept the rooms cool. And the AC in the bedroom cooled it down very quickly. The beach chairs, cooler, and beach towels were great to have as we explored the North Shore beaches. Brittany provided lots of information before our trip and was very helpful with our questions. Can't say enough about how much we loved staying here! Thank you for such a great review of your stay at the One Bedroom Apartment in our Sunset Serenade! We are so glad that you enjoyed the beach chairs, cooler and beach towels that were provided for you to make the best of your vacation on St. John. All of our units include AC in the bedrooms and are able to cool down rooms quickly. We are glad that it was able to help keep you cool during your stay. 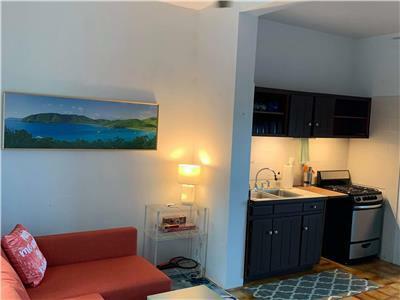 The One Bedroom Apartment along with our other units at Sunset Serenade are in a great location for visitors to enjoy being close to Cruz Bay with an amazing view. We were so happy to share it with you! We look forward to welcoming you back on your next trip to St. John! Thank you to Brittany, Robert and Paige for helping make our stay in paradise so much better. Adorable accommodations! There were 3 of us in the one bedroom suite. One guest slept on the sleeper sofa which was quite comfortable. The king size bed had a great mattress! We have slept on some where you “roll” to the middle so felt like this is worth mentioning! The bedroom is the only room with AC, but the two ceiling fans and the standup fan in the living room were quite sufficient. Outside is a lovely day bed with another ceiling fan and a beautiful view. Best place to see the sunset! From the snack basket to the coffee and water and beer in the fridge, you are made to feel very welcome. The beach chairs, coolers and beach towels were used and greatly appreciated. They additionally had an automatic dispenser in the shower for shower gel and shampoo! We would highly recommend staying here and look forward to our return trip. A car is necessary to explore beautiful St. John. Island Abodes has reserved parking for each cottage, which is great! Another big feature which you don’t think about, is there are outside trash cans to dispose of your trash daily as opposed to having to trek it down to the dumpster. Keep up the good work and see you next trip! Debi, thank you so much for the wonderful review of your stay in the One Bedroom Suite at Sunset Serenade! We are so happy to hear that you found the accommodations to be comfortable, spacious, and well appointed. The private outdoor deck is certainly one of our favorite features, with those beautiful island views! I'm glad the variety of welcome amenities were enjoyed, and that you found the suite to be fully stocked with beach essentials. We cannot wait to welcome you back to Island Abodes and our little piece of Caribbean paradise during your next St. John vacation! Come back soon! The Sunset Serenade Suites above Cruz Bay are immaculately maintained and have fabulous views over the sound towards St. Thomas both day (a fabulous rainbow) and night (almost magical lights across the dark water). A bonus extra in my unit, the 1-bedroom, was a net-covered sofa bed for sleeping out on the covered deck. I was by myself but it would be worthy of going back with my wife in the future. I got by without a car by getting a taxi up the steep bill and hiking down -- but even the hike down to town is challenging, it's so steep in places. Robin, it sounds as though you had a magical stay in the One Bedroom Suite at Sunset Serenade! Thank you for sharing your experience with us. I'm happy to hear how much you enjoyed the gorgeous Caribbean views from the private deck. It sounds as though you truly embraced island living! We hope to welcome you and your wife back to Island Abodes in the future. I absolutely LOVED our stay here! Everything was perfect. Without a doubt stay here! The apartment was stocked with no worries. And the large back deck was my favorite spot! I felt comfortable and relaxed here just as you should when on vacation. I do have to say though.. we paid a $45.00 service fee and was pretty much given a clean up todo list upon departure. Even though My boyfriend and I always clean up after ourselves and were doing it anyway I didn't like it being asked when paying a service fee. Also since our check out time was 10:00am (kinda early specially when everyone else runs off island time) and Check in is 4:00pm there was plenty of time for house keeping to do what was asked of us. Being they were coming right behind us. But all in all really enjoyed every bit of thought in effort made into our stay! Brittany was very helpful, kind, and informative! We had a wonderful time staying at Brittany's. The apartment was clean and the view from balcony was so beautiful! 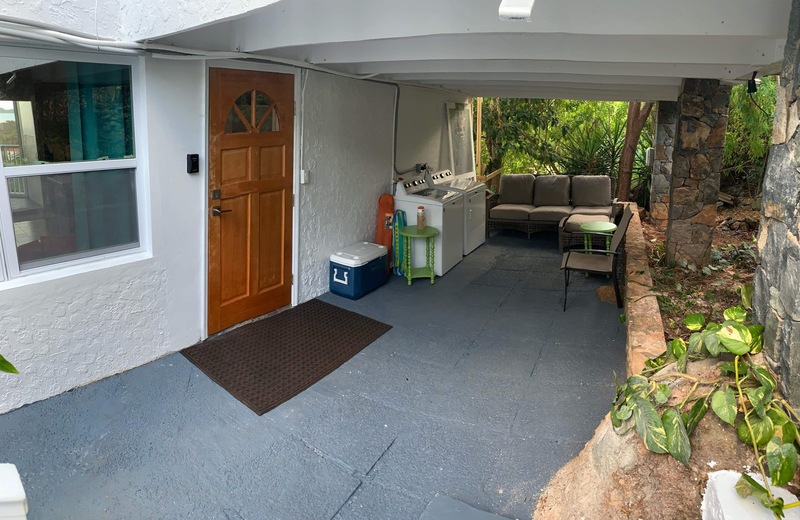 It is located on a hill so it'll be convenient for people who drive, but we pretty much hiked to the apartment from Cruz Bay and it wasn't bad at all! Brittany is also super accommodating and approachable. This is by far the best experience I've had with Airbnb, thank you Brittany and Robert for making our stay so enjoyable! Aww what a great review, thank you Chloe! Robert and I are so honored to be considered your best Airbnb experience, and we can't thank you for enough for sharing your feedback! Thank you for the details regarding the location and condition of the accommodations. We're so glad you enjoyed your stay and hope to see you again in the future! Thanks again. Great value, excellent scenic location with great views. Perfect for a family or romantic holiday. Hi John! Thank you for your review of the One Bedroom Suite at Sunset Serenade. So happy to hear you found your Island Abodes accommodations to be conveniently located and of great value! We sure do love those sweeping Caribbean views from the private deck, too. Come back to visit us on St. John again soon! Our host was fantastic! She emailed us everything to expect in advance and gave us tips about what to pack and how the island is set up. The apartment was so clean and stunning views! They even had a welcome bowl with a note and some treats when we arrived. We can't wait to visit again and stay there! We had a full kitchen, access to a grill and they even provided beach chairs and a cooler! Our hosts went above and beyond our expectations! Mike, I'm so happy to hear how much you enjoyed your stay in the One Bedroom Suite at Sunset Serenade! It was our pleasure hosting you in our little piece of paradise. I am thrilled that the suite exceeded your expectations and that you found it clean and well stocked. That Caribbean view is pretty incredible, if we do say so ourselves! Glad you were able to take it all in. Robert and I can't wait to welcome you back to Island Abodes for your next St. John vacation! We spent 3 days at Brittany and Robert's place. The view is awesome and Brittany met us at check in and checked in everyday to make sure everything was good. She offered suggestions and was very helpful. She advised us to rent a 4 wheel drive and I rented a car....I would suggest that you listen to her and rent a jeep to get to their place. You are close to town (3 min drive) but it feels like you are in the rainforest with great vistas. The place had everything you could want or need. Donald, thank you so much for taking the time to write a review of your stay in the One Bedroom Suite at Sunset Serenade. I'm glad you found the suite to be well stocked with amenities and that you enjoyed the beautiful Caribbean views. Robert and I strive to provide excellent customer service to our guests so I'm happy to hear that you found my suggestions helpful! A Jeep rental definitely enhances the St. John experience. We hope to welcome you back to Love City for another stay with Island Abodes soon! Very comfortable and scenic location. Great view off the deck, kitchen and from the bedroom! Hi Amy! Thank you so much for your review. We are happy to hear that you enjoyed the views from the One Bedroom Suite at Sunset Serenade! Island Abodes hopes to welcome you back to sunny St. John again soon. Island Abodes Earned a Repeat Customer! Brittany was always checking on us to make sure our stay was great. Only positive feedback to give to her, she was fantastic! The single bedroom had an amazing view and she earned a repeat customer. Hi Kevin! Thank you so much for the review and recommendation of Island Abodes and the One Bedroom Suite at Sunset Serenade! Robert and I strive to provide excellent customer service to our guests and our goal as small business owners is to build relationships that will lead to repeat visits - so we are so excited to hear that you will be back to enjoy more of those amazing views! We can't wait to welcome you back. As described and hosts were very helpful. Brian, so happy to hear that the One Bedroom Suite at Sunset Serenade met your expectations! We hope to welcome you back to Island Abodes soon. We truly enjoyed our stay! Beautiful view and the landscaping on the property is impressive and inspiring. 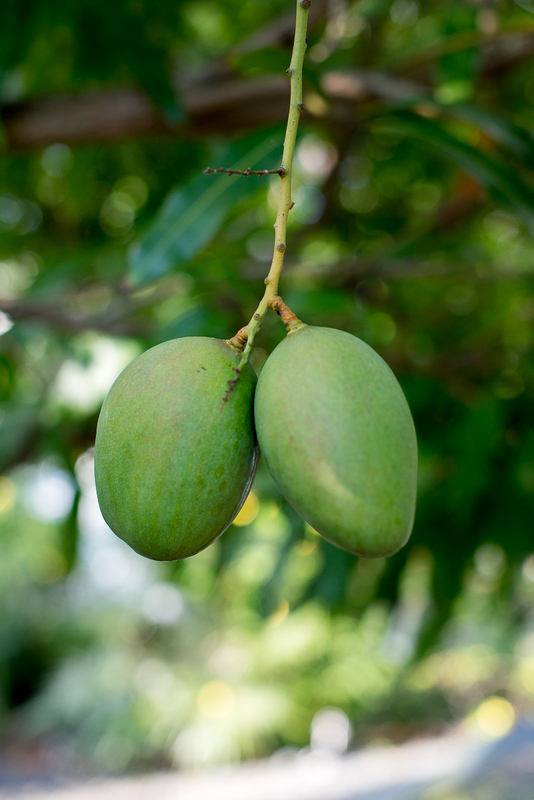 Fruit trees and tropical flowers abound! The kitchen is wonderfully stocked with everything you need to prepare entire gourmet meals. We went to the grocery store and cooked all of our meals here! My boyfriend is a great chef and he wanted for nothing in the well-equipped kitchen. Great movies available for free on the tv. We loved the outdoor daybed for afternoon lounging while enjoying the view. The bed...I could have slept for DAYS in that comfortable bed and the AC keeps the place as cool as you like it! The shower is creative and awesome. I wish I would have taken a picture. You feel like you are in an outdoor shower, yet you have the privacy of it being indoors. I sat for nearly half an hour sipping tea made in the Keurig watching 5 iguanas in the nearby tree happily chomping their breakfast of leaves. Brittany and Robert are conscientious and gracious guests. Robert wanted to do a little yard work nearby at around noon and checked with us first to make sure we weren't sleeping. We actually were and he said he would come back and do it in the afternoon. I don't think I have ever stayed anywhere where the owners were thoughtful enough to change their schedule to accommodate our lazy day. We will definitely be back! Thank you so much for the lovely review of your stay in the One Bedroom Suite at Sunset Serenade, Katie! I'm so happy to hear how much you enjoyed the accommodations, especially for your birthday trip! I'm glad you found the kitchen to be well stocked and that you were able to take full advantage of the suite, from the comfortable bed to the unique shower and the relaxing outdoor living space. It sounds as though you found your Caribbean home away from home, and truly embraced island living. Robert and I are always more than happy to accommodate our guests' schedules, as we know vacations are a time for rest and rejuvenation! We can't wait to welcome you back to Island Abodes and sunny St. John again soon! Brittany and Robert have thought of everything to make guests comfortable. They are friendly, helpful hosts. The One Bedroom Suite is spacious and well appointed. The bedroom has a very comfortable king size bed.The bathroom has a roomy, unique shower and a sink with plenty of shelves and drawers. The full kitchen is well equipped with full oven and microwave, and a Kurig coffee maker --- coffee is included! The adjoining sitting area has a flat screen TV with Netflix included. The BEST part is the very private, large deck overlooking Cruz Bay with a table for meals. Also, a lovely day bed with mosquito netting and indirect lighting for evening reading or naps. The carpet makes it a great place for a bit of morning yoga while the humming birds and finches flutter and the iguanas perch on neighboring trees to catch the sun. 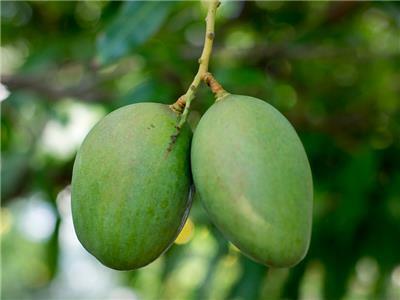 The whole complex is immaculately maintained with lovely trees, shrubs and flowers. The common area includes a brand new gas grill. Every unit has an assigned, off the street parking space! In addition, the location is very desirable. Literally, five minutes to a large, complete grocery market, liquor store, drugs store. The north shore beaches are about a 15 minute drive, and Coral Bay is about a 40 minute drive. Very convenient. We enjoyed visiting with our hosts- a lovely, hard working couple who know how to make their guests welcome and happy. Thank you so much, Linda, for the kind words and awesome review of your stay in the One Bedroom Suite at Sunset Serenade! Robert and I are so happy to hear you found the accommodations to be comfortable, clean, conveniently located, and well stocked with amenities. We absolutely love the private outdoor deck, too; it’s an island living essential! It sounds as though you were able to relax and unwind while on your Caribbean vacation, which is what we love to hear from our guests. Robert and I are always available to answer questions and give recommendations! We hope to welcome you back to Island Abodes and sunny St. John soon. My husband and I scored when we chose this property on a recent trip (our first) to St. John. It's everything we hoped for, based on the reviews, and more. It's the perfect size and layout for a couple. The kitchen had everything we needed to prepare breakfast, pack a lunch for the beach, and enjoy happy hour snacks while watching the sunset. The bed was very comfortable and we found that turning on the a/c just before bed provided a perfect temp. I absolutely loved the shower! The decor is very fresh and beachy. Everything we needed for the beach (chairs, noodles, cooler, towels) was provided, and very much appreciated. We had a Jeep for our visit, but decided to walk into town (20 minute walk) before dark and took a taxi home ($5/pp, plus tip). Once we were more comfortable with driving and finding parking, we'd drive into town for dinner. The Starfish Market is conveniently located just down the hill from the property. I recommend buying a bag of ice to keep in the freezer for drinks and the cooler. Bring a good book and settle into the day bed on porch--heaven! I can't wait to return for another visit! Thank you so much for the awesome review of your stay in the One Bedroom Suite at Sunset Serenade, Jennifer! I'm beyond happy to hear how much you and your husband enjoyed the accommodations. It sounds as though you truly found your island home away from home in this suite! Robert and I try to think of everything we would want in a vacation rental and then we do our best to provide those items to our guests; the beach items are essential in the Caribbean! We are always glad when our guests are truly able to embrace rest and relaxation, island style. Please come visit Island Abodes and sunny St. John again soon! Just had a great 5 night stay in the One Bedroom Suite, Island Adobe takes great care of their property and their guests. Very clean and quiet place to stay. We had all the amenities needed for a quick breakfast daily, packed a lunch for beach hopping, close to town, easy access to retreat back for a few hours before going into town for dinner. Enjoyed drinking coffee and watching Cruz Bay from the patio. Thank you for the use of the beach blanket and towels. There is also chairs, pool noodles, and an ice cooler for use. Great place to stay. We look forward to our next trip and will definitely use Island Adobe again. If you get a chance make sure to book a boat charter with Sunshine Day Charters, Captain Rob will take good care of you and take you to the magic wonders of the BVIs. Hi Amy! Thank you so much for the review of your stay in the One Bedroom Suite at Sunset Serenade. We're happy to hear you found the accommodations to be quiet, clean, and well stocked with amenities. 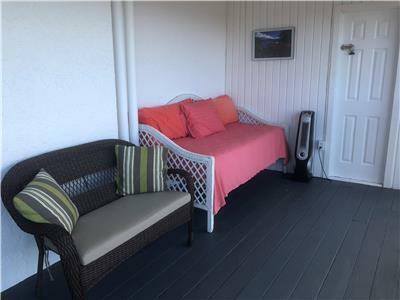 It sounds as though you were able to relax on the private deck as well! We can't wait to host you at Island Abodes on your next St. John vacation! We can't wait to return again and stay at Island Abodes! My fiancé and I stayed at the One Bedroom Suite in Cruz Bay and had the experience of a lifetime. The accommodations were perfectly serene and the view was spectacular. The unit was well equipped with kitchenware, beach supplies and shower essentials. We rented a Jeep as Brittany suggested and spent ample time exploring parts of the island Brittany so kindly recommended. We were able to enjoy breakfast and coffee on the deck and pack lunches for our daytime adventures. Brittany were very communicative and quick to reply both prior to arriving in St. John and during our stay, for which we are eternally grateful. Thrilled to hear you and your fiance had an expectional stay in the One Bedroom Suite at Sunset Serenade, Hilary! Thank you for taking the time to write a review. I'm glad you found the accommodations to be relaxing and well stocked with amenities. We love the beautiful Caribbean views, too! I am always happy to share recommendations for this little piece of paradise, and I love hearing how much fun you had adventuring around the island! Come visit Island Abodes and Love City again soon! The pictures and reviews were exactly what we expected. Brittany was easy to get ahold of and was constantly in touch with us prior to ur arrival. Loved this location. Apartment had all the amenities needed. Thanks Brittany!!! Faith, thank you so much for taking the time to write a review of your stay in the One Bedroom Suite at Sunset Serenade! I’m so happy to hear that the suite met your expectations and that you found the provided amenities to be useful. We hope to welcome you back to St. John for another stay with Island Abodes soon! Sunset Serenade apartment was great. Even before we arrived i was impressed with Brittany's quick responses to my questions and emails. The apartment was very clean and contained everything we needed and then some. I appreciated the items in the fridge, ( mayo, coffee, etc) so we didn't have to waste money on odds and ends. The grill was a plus! The view was spectacular! All in all, a wonderful time was had by all! Many thanks for the review, Leslie! I love to hear that the One Bedroom Suite at Sunset Serenade met your expectations and that the provided amenities were put to good use. Robert and I do our best to think of everything we would want in a vacation rental so we can meet our guests needs! I am always available to answer questions prior to and during your trip to ensure you have the most relaxing and comfortable vacation possible. 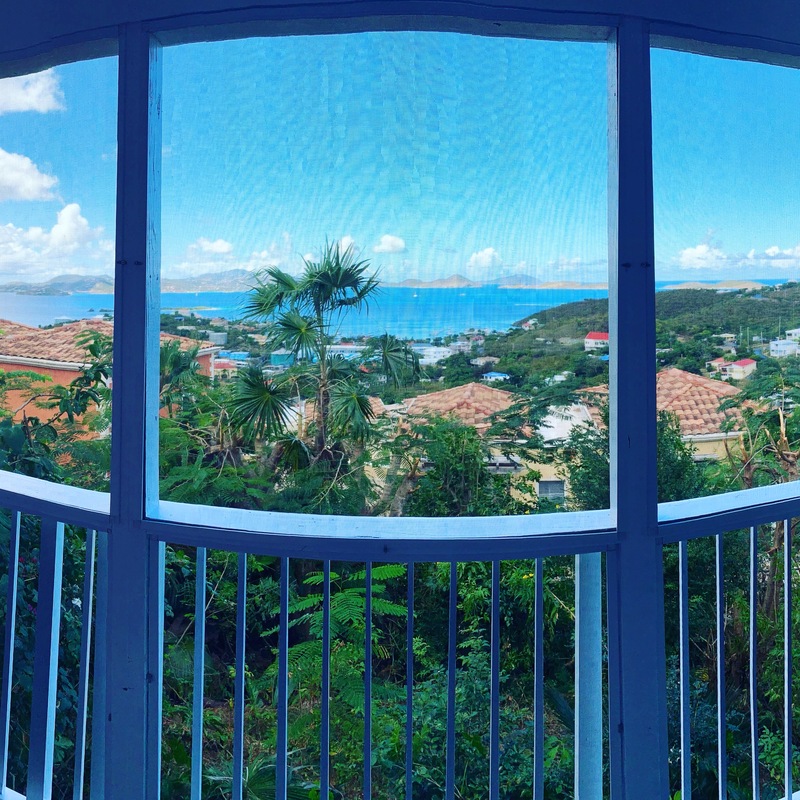 The Caribbean views from the private deck are certainly stunning! I’m glad to hear that you enjoyed them and that you had a wonderful visit to St. John. Come stay with Island Abodes in Love City again! My boyfriend and I rented the one bedroom suite at Sunset serenades at the very beginning of the season. It was our first visit to St. John so we planned on doing research before we came to educate ourselves as much as possible. Brittany was always readily available via e-mail or cell phone to answer any and all questions that I had - big or small, related to our accommodations or not! Everything regarding our rental was laid out in advance in great detail so we knew what to expect in that arena. When we arrived, our rental was clean, spacious and had a spectacular view of Cruz Bay. It was everything we were hoping for and more. Our visit was too short, and we will definitely be back! Thanks so much Brittany. Carly, we loved hosting you and Josh in the One Bedroom Suite at Sunset Serenade! Thank you for taking the time to leave your review on VRBO. I am always ready and willing to assist with travel and island questions so that you can experience the best vacation possible, especially when visiting St. John for the first time! Thrilled to hear that you found the One Bedroom Suite to be clean and spacious. It sounds like the panoramic view from the private deck took your breath away, as it does ours! Please do come back soon for another stay in Love City with Island Abodes. This place was great! Brittany was very helpful and added extra little touches that made the stay even better! The view is wonderful! The location is great! We rented a car to get around, but also walked down and back to Cruz bay one night, which didn't take too long. 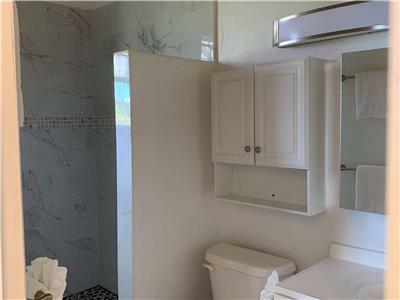 The place is also very clean and appears to be recently remodeled. Couldn't of found a better place to stay! Hey Spencer, thank you for leaving a review of your stay in the One Bedroom Suite at Sunset Serenade! We are thrilled to hear that you loved the provided amenities, convenient location, and the awesome view from the private deck. I personally ensure that our accommodations are clean and well-stocked prior to each guests arrival. So happy that you enjoyed your vacation on St. John with Island Abodes! We hope to welcome you back to Love City soon. We loved staying here and will be back! Brittany showed us the property and was very nice. Awesome views! Julianna, thank you for the kind review! It was so nice to meet you both and I'm happy to hear that you loved the One Bedroom Suite at Sunset Serenade. We agree that the views are stellar! Island Abodes looks forward to welcoming you back on your next Caribbean vacation. It was off season in St John and we really didn't know what to expect . There were a few places closed but enough open that we found everything we needed . Brittany was very very helpful , unit was very clean and we were upgraded free of charge because of slow season (THANK YOU BRITTANY) . We rented a jeep close to red hook ferry that I would highly recommend. Driving on the left was Fine , I was worried but had a good navigater. The highlight of our trip was a boat trip to BVI on Bad Kitty , highly recommend . Overall experience was 5 Star thanks mostly to the wonderful Villa , Thanks Brittany for making our stay a wonderful one. Ben & Pam, thank you so much for taking the time to write a review of your stay in the One Bedroom Suite at Sunset Serenade. There is something special about visiting St. John during the off season and it sounds as if your expectations for your Caribbean vacation were exceeded! No matter what the season, there are always places open on island to stock up on necessities, enjoy a decadent meal, sip delicious cocktails, and relax gorgeous sunset views. I love to hear that you mastered left side driving while exploring with a Jeep rental. Having your own transportation during your stay is definitely helpful! Bad Kitty runs an incredible BVI trip – so glad you had fun! We hope to welcome you back to Island Abodes soon. We were delighted to spend a few nights gets here! Every detail has been considered for guests comfort and happiness! The welcoming snacks, sunscreens, the cleanliness and the decor all set the tone for an island experience you'll love! Brittany and Robert are warm and friendly, and you feel like friends immediately! I've stayed at many places on island, and this is one of the very the nicest I've found! Thank you for a wonderful review and 5 stars Heather! Robert and I appreciate your feedback and kind words regarding your recent stay in the One Bedroom Suite. We love that you consider it one of the nicest places you've found, and we hope to continue to welcome you back to our beautiful little island. Thanks again! Perfect vacation and wedding on the beach! We stayed a week at this unit and the it was perfect for the two of us. It had a beautiful view of the water on a very spacious porch, that I spent a lot of time on enjoying all the tropical trees and birds and iguanas. The unit was equipped with everything from sunscreen to beach chairs and umbrella and cooler and books to read that we really only needed to bring our clothes. The owners have everything organized and labeled from parking to any directions you might need on your journeys around the island. We rented a car and it was so close to town and th grocery store. They also recommend great places to eat and tell you about all the beaches you can visit on the island. I have never rented from someone on VRBO that was as helpful and truly wanted to make our trip a memorable one. Thank you for letting us enjoy your piece of paradise. We appreciate you taking the time to post such a great review on VRBO Libby! And thank you for choosing Island Abodes for your trip to St. John - we know you had many options when finding a place to stay. Robert and I were happy to hear that you enjoyed the One Bedroom Suite, especially the amazing porch. We're also glad you had everything you needed right in your suite and that you felt well taken care of. We know traveling to our beautiful little island can be nerve-wracking if you've never done it before, so we just do our best to make our guests feel comfortable and welcome, from the moment they inquire about booking to after they leave us. Thank you so much for such a great review. You were a great guest and we'd love to welcome you back to our piece of paradise anytime! We had an amazing time on St.John! The views were spectacular, and I enjoyed drinking my coffee on the balcony every morning. Brittney and Robert really go the extra mile for their guests. They provided chairs, a cooler, beach towels, and snorkel masks! This made it much easier to pack and we had everything we needed for the beach. They were also available when questions came up, and it was great to have a local to tell you what to do. I can't wait to plan my next trip with them!! I would highly recommend them and their property! Many thanks for your review! It was great to hear that you enjoyed your stay at the One Bedroom Suite and that you had an amazing time on St. John. Thank you for including details of the amenities provided in the suite, we always want to make your trip as easy and convenient as possible. We love St. John and want all of our guests to too, so we do our very best to answer any questions or concerns our guests have. Thanks again for posting a review and for your recommendation. We look forward to welcoming you back in the near future! Thank you for your review and for sharing your feedback on VRBO! We're happy to hear you enjoyed your stay in the One-Bedroom Suite, especially that amazing view and comfy outdoor daybed. We're also glad you had everything you needed to cook a meal or get ready for a night out in Cruz Bay! Thank you again and we look forward to seeing you in the future and once again having you a guest! Our 23 and 18 year old children stayed in the 1-bedrom while we stayed in the Penthouse during our family vacation. Brittany and Robert were gracious hosts and attended to every need - from the welcome basket to towels, chairs and coolers for the beach. The space was just the right size with a bed that slept great, amazing "outdoor-feel" shower, Keurig and a great view from the patio. We really enjoyed our time at Island Abodes and hope to return one day! Thank you for the review Penny! Robert and I truly enjoyed your whole family and we can't thank you for enough for choosing Island Abodes and for taking the time to post a review. We really hope your "kids" enjoyed their stay in the One-bedroom and that they had everything they needed. Thanks again and we hope to welcome you back in the future! My husband and I stayed in the 1 bedroom unit at Sunset Serenade last week. It was wonderful. Very clean, a comfy bed and had all the accommodations of home. We loved the beautiful view of Cruz Bay. Brittany and Robert were WONDERFUL hosts. While we were on the island we kept hearing horror stories from people we met about their accommodations from the places they were staying at. We kept telling them to visit the Island Abode website for their future visits. No complaints and WE WILL BE BACK. Robert and Brittany ROCK big time! The time we spent in their 1 bedrm apt was wonderful, and their flexibility with schedules made our stay very memorable and easy. We will most definitely stay there again next time. St. John is our most favorite vacation spot, and this place just made our experience better than ever. Thanks so much! Fantastic accommodations and hospitality! My husband and I stayed in the one bedroom apartment which also had a living space, full kitchen and private bathroom! We came to St John with two other couples who stayed upstairs in separate units. Perfect accommodations for hanging with your friends but having your own private space. Brittany has thought of everything you need at your home away from home! My husband and I will definitely be coming back to stay in a Sunset Serenade unit! Amy, thank you so much for the fantastic review of your stay in the One Bedroom Suite at Sunset Serenade! I'm so happy to hear you were able to enjoy time with friends while also taking advantage of the privacy offered in your spacious suite. 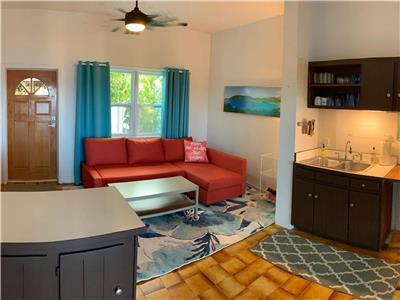 It sounds as though you found the accommodations to be well stocked with a variety of amenities, truly making this your island home away from home. We hope to welcome you back to Island Abodes and sunny St. John soon! We had a wonderful week enjoying the hospitality of Brittany and Robert at their one bedroom home rental on St John. It had everything one would need both to stay at the house and go off to the fabulous beaches for the day. We made use of the cooler, beach mat and beach towels every day. Returning back to a clean comfortable place with a hot shower, big deck overlooking the bay, and finally a comfortable bed completed the day. Thanks again. We'll be back.” –Lillian “Just got home from a wonderful week at the one-bedroom apartment at islandabodes. I am ready to go back! Brittany and Robert have worked hard to make everything beautiful and welcoming. The apartment was beautifully furnished. We enjoyed the amazing view of Cruz Bay and the convenience of riding to town and the north shore beaches. I had the pleasure to meet both Brittany N Bob. The place is great! Clean n well equipped. they covered everything you could think of to make your stay comfortable. The view is amazing! I would definitely recommend having a vehicle to get to and from town as well as around the island. Thanks so much Chris, Robert and I really enjoyed meeting you! You were such a great guest and we can't thank you enough for posting such a nice review on Airbnb! It sounds like you enjoyed your stay, the view and your comfy accommodations. Again, thank you and we hope to welcome you back again in the future. Happy Holidays! Thanks so much Neil! Robert and I loved having you both as guests and were so glad to hear that you enjoyed both your first trip to St. John and also your stay with us at Island Abodes. Nothing makes us happier than to hear that the apartment and the amenities exceeded your expectations and that you had everything you needed for a great day at the beach! Thank you again for taking the time to share your feedback and post it on Airbnb. We hope to welcome you back very soon and would love to have you anytime! This place couldn't really be much better. Incredible location : overlooking Cruz Bay, up in the hills, iguanas in the rubber trees, cool passing rain showers. Brittany and Robert were exceptionally helpful; picking us up at the ferry and making themselves available for anything we needed. They have a wealth of information regarding St. John's. The neighborhood itself is quiet and peaceful. The apartment was set up perfectly for a vacation week: full kitchen, super comfortable bed and a rock tile shower that was unique and wonderful. It was hard to leave the large relaxing balcony everyday, which offers an incredible view of the entire west side of the island. Caribbean air flows through at all hours. We cannot not recommend IA highly enough (and we will certainly be back). We can't thank you for enough for your review Kristen! And congratulations again on your recent nuptials! We really appreciate you providing so many details about the accommodations and your stay with us at Island Abodes. We've gained a lot of knowledge over the years living on this little rock, and we hope being able and willing to share that with our guests is just one more thing that sets us apart! We'd absolutely love to have you guys back, so please do keep us in mind when planning your next trip to St. John.. Thank you again and best wishes! Thank you Fernando! We loved having you and your wife stay with us - you were such great guests. It sounds as though you enjoyed the property and found it very clean, inviting, and well-equipped. Thank you for posting a review and for your recommendation. We truly appreciate it and hope to see you again soon! We can't thank you enough for your great review Steven! It was truly my pleasure to provide transportation upon you arrival. Robert and I just want to ensure our guests feel welcome and comfortable with the island as soon as they arrive. We hope you enjoyed the restaurant recommendations - we love to share our favorites with our guests! We were so pleased to hear you enjoyed the One Bedroom Apartment and that you plan to stay with us again. We'd love to welcome you back and think you'll be impressed with any of our Island Abodes properties. Thanks again Steven! Thanks so much Albert! We appreciate you taking the time to give us such a great review. You and your family were a pleasure to host and we're just happy to hear you guys all had a good time and had everything you needed during your stay! We're excited for your next trip and thank you again for both your review and recommendation. We hope to see you soon and thanks for choosing Island Abodes! The trip to Cruz Bay was amazing. Brittany was a wonderful host and took care of us the moment we got off of the ferry. She was very accommodating and her setup at the apartment prepares you with everything you'll need for your trip. The one bedroom apartment was everything it was portrayed to be. A fantastic patio and patio view. Full kitchen, beautiful bathroom and bedroom. The apartment was very comfortable and a delight to come back to at the end of our long days. The location is a quick 5 minute cab ride into town. Things couldn't have gone better on our trip and Brittany's place was a huge reason why. So nice to read your review Gary, we can't thank you enough for taking the time to share your feedback on Airbnb! Your kind words are much appreciated and we're just so glad that you enjoyed your stay with us at Island Abodes. Based on your review, it sounds as though you really had a great time on St. John, and we're just happy to have been a part of it. Thanks again and please know we'd love to have you back anytime! Amazing View and Great Owners! My husband and I, along with our two little girls, were the first to stay in Robert and Brittany's 1 bedroom condo. We had a great experience! The owners were very welcoming and accommodating, and even took my husband to the grocery store as soon as we arrived. This condo has a large porch with an amazing view, and we loved hanging out there sipping coffee or eating breakfast. The bed was very comfortable, and all the windows in the bedroom looking out onto lush vegetation and the view of the ocean made for a great scene to wake up to each morning. We also loved the unique bathroom. The whole setup made for a peaceful and relaxing getaway in paradise. We were sad to leave and would definitely enjoy staying at this place again! Thank you so much for your review Christine! As our first guests, you will always hold a special place in our hearts and we appreciate you taking the time to post a review regarding your stay! It sounds as though you and your family had a lovely stay and we were so pleased to hear you enjoyed the view, the comfy bed and porch and bathroom! Our goal is to provide you with a relaxing stay and we love nothing more than to hear that we did just that. We too were sad to see you go and look forward to your return! Our stay on St John was fabulous. We had a one bedroom, one bath room with a roomy deck overlooking the Ocean, Cruz Bay, and Mongoose Junction. The second night we were sitting on the deck having a drink before we went out for dinner and experienced the most beautiful sunset. We made it a point the rest of the trip to be on our Deck to duplicate that wonderful sight. But, what really made our mini vacation was the hospitality and advice we got from our hosts. We went to several beaches, took a private boat trip, went snorkeling, hiked, played tennis, got a massage, eat lunch and dinner at many different unique places and best of all we did all that within our budget. We will definitely go back to St John and request the same accomodations. Fantastic Vacaction. Thanks for your review! Aren't those St. John sunsets just beautiful? Seeing them is one of our favorite things about living here! We were happy to hear you enjoyed your stay with us and that you were able to do so many awesome activities during your stay on St. John. We look forward to seeing you again in the future! Thanks again. My husband & I stayed here for a week in March 2015 on our babymoon. I was 6 months pregnant & it was just what we needed. A great unit with a full kitchen, stunning views, and wonderful owners. We wanted to relax, enjoy St. John, hike & enjoy the beaches. The unit is great. Great views from the bedroom and living space/kitchen. Outdoor seating perfect for breakfast, which we made each day at the unit, & happy hour during sunset. One of my favorite days was just watching the iguanas climb the trees around us and sun themselves. The unit has no AC which was NO issue for us. The tropical breeze hits the unit and the ceiling fans were plenty. Robert & Brittany are wonderful hosts. They helped us find the grocery store, pick beach spots & get around overall. US cells work there, so it was super easy to text Robert and get his advice. They are like personal concierges! They had beach chairs, towels, coolers, BBQ grill, fully equipped kitchen & were so helpful. We would definitely recommend staying at one of Robert & Brittany's properties. Definitely rent a 4-wheel drive vehicle on St. John because the showers can hit and you still need to get up those hills. Having your own car to traverse the island is the only way to go. Many thanks for your review Jenny! We hope your babymoon was everything you hoped for and needed for your last vacation before your precious baby arrived. We do hope all is well and that the whole family is doing great! We appreciate your kind words and details regarding your stay with us. It was truly our pleasure to assist you during your time on St. John and we hope to welcome you back very soon, baby in tow! :) Thanks again! My family and I were recently looking for somewhere near Cruz Bay to rent and came across Island Abodes. Having not stayed on this side of the island previously it was nice to get the sunsets and a brilliant view over Cruz Bay. At night you would get some sounds drifting up but we found this to be pleasant - above it all but still close enough to get a vibe. The place itself was nicely done, high ceilings and slatted windows, and a very large balcony space where we spent a fair amount of time. The bathroom was excellent and it felt as if you were outdoors when taking a shower. The owners were very accommodating and reacted quickly to any request. I would recommend this stay to anyone looking for accommodation close to Cruz Bay. We appreciate your review and can't thank you enough for providing insight to your recent stay with us. It sounds as though you and your family enjoyed your time here on the island and that's all we ever hoped for. We were glad to hear you found us easy to get in touch with and accommodating and we do hope you'll consider staying with us again upon your return to St. John. Thanks again! Highly recommend this vacation spot. 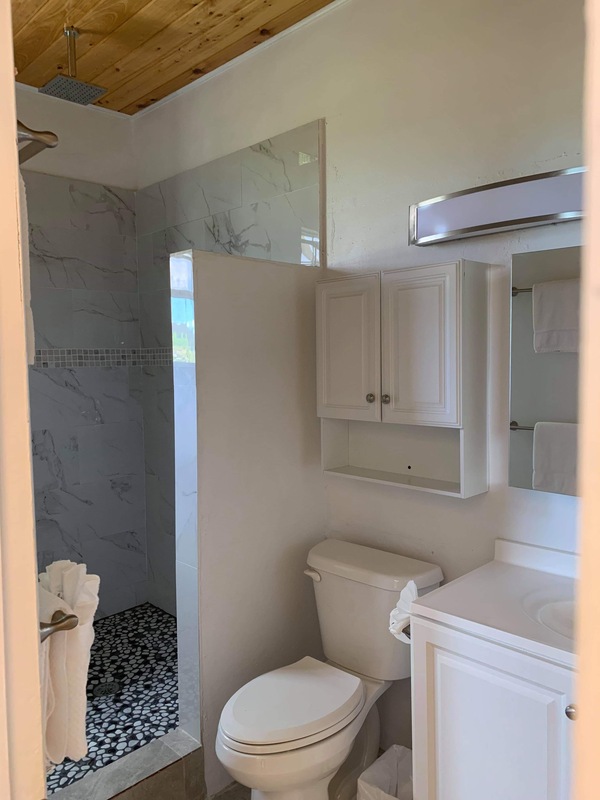 Affordable, great location on St John, wonderful view of Cruz Bay, and convieniently located to shopping, grocery stores, bars, dinner, taxi's etc. The kitchen was perfect and our meals on the deck was ideal. The hosts went out of their way to accommodate us and the advise about what to do and where to go on St John saved us a ton of money. We will duplicate this vacation. It was great!!! Thank you for your recommendation and for taking the time to post a review on Vrbo! Both Robert and I were delighted to hear that you found your accommodations convenient with wonderful views and an ideal kitchen. It truly was our pleasure to assist you with local information and make your trip more affordable. We can't wait for your duplicate vacation... We'll be waiting! Thank you again. Perfect Stay in the heart of paradise! We couldn't have asked for a better stay in St. John. The 1-bedroom was perfectly appointed, spacious, and the views from the deck were unbelievable. John and Brittany went out of their way to ensure we had the best time possible while we there providing us with some beach towels and chairs and even a cooler. The extra fans in the bedroom were a really nice touch as it did get a bit hot during the night time! The internet was fast and allowed me and my girlfriend to stay in touch in the evenings. The walk to Cruz Bay is pretty easy, though I wouldn't want to venture up the hills back from CB so I would definitely look to take a cab! Renting a Jeep on the island is definitely the way to go so you can head off to some of the more secluded beaches and hit up a grocery store. Breakfast each morning on the balcony was such a highlight of the trip. Thanks again Robert and Brittany! We'll definitely be back! Hi Mike! 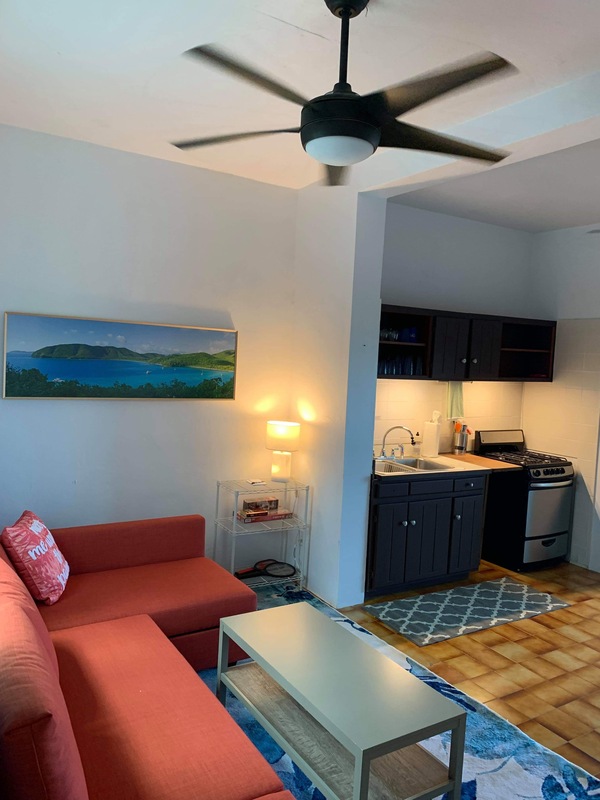 It sounds as though you thoroughly enjoyed your time on St. John, especially in our one-bedroom condo and we can't thank you enough for sharing your feedback. We appreciate your kind words and details for future guests and we hope to see you again real soon! I stayed in the 1 bedroom apartment and was extremely satisfied! The unit contains everything you need...even a cooler and chairs for when you head to the beach for the day. The day bed on the LARGE patio was a great spot to lay and watch the stars or curl up with a good book. Location is close enough to Cruz Bay so you can enjoy all Cruz Bay has to offer but far enough away so you can enjoy the peace and quiet when you want it!!! Thank you for your review! We were very pleased to learn you had everything you needed while staying with us, that you found the location convenient, and that you were able to enjoy the day bed at night - the view of the stars on St. John is unparalleled and we were glad to hear you experienced that. Thanks again and we hope to see you again in the future! We had a great time staying with Robert and Brittany. Robert even picked us up at the ferry, which was so awesome of him!! The apartment is fabulous. It wasn't just clean and had all the amenities, but it felt like staying at a 5 star hotel. The pictures don't do it just, it was super fancy inside and around the property. It's really close to town. One could walk if you wanted to but it was also super easy to catch a taxi into town. Cruz bay has everything you would want from a cute Caribbean vacation town, including shops, bars, restaurants and flea markets and of course beautiful beaches. We recommend renting a jeep at least for one or two days to explore the island. Our favorite beaches were waterlemon (amazing snorkeling) and maho bay (most beautiful white sand beach) we also loved cinnamon bay (best of both worlds with white sand beach and awesome snorkeling) I would definitely stay with Robert and Brittany again. They were great hosts who let us have our privacy but we're always available for answering questions and giving advise. Thank you for everything!! Undoubtedly Recommendable!! A home away from home. My fiancé and I stayed in the one bedroom villa at Island Adobes, St. John. This villa is literally a 5 minute ride from the ferry dock and amazingly convenient for anyone, even if you didn't have a vehicle. It's near all the local restraunts, gas stations, and food markets. Upon first entry to the villa we immediately fell in love. The view is to die for and the villa was welcoming and extremely clean. We had the pleasure of meeting one of the owners by the name of Robert who immediately after introducing himself truly tried to attend to any needs we had which was very considerate especially after, all of our expectations were already met. We truly couldn't have asked for a better stay. We have been telling all of our friends and we plan on visiting again and we will refuse to stay anywhere else. We recorded the amazing sounds of nature and the sea breeze at night. Hoping to replicate it to play in our home. It was truly relaxing. It reminded us much of home. It had volted cielings, and an amazing patio area with a day bed that was great for our early morning coffee and island delicacy's we purchased on the island. To our surprise there was a Keurig which we loved. It was stocked with Starbucks and French Roast cups. This truly took me away because I came ready with instant coffee and it was a pleasure not having to submit to it when I am so use to our early morning Starbucks run before the office. Which also made the wifi so convenient. Thank you very much Brittany and Robert for amazing hospitality. You'll definitely see us again. Many thanks for your great review Danielle! We appreciate all of the details and were just delighted to hear that you and your fiance felt welcome and relaxed during your stay with us. It sounds as though you both had a wonderful time and we can't thank you enough for your recommendation. We hope the recording of the island sounds will tide you over until you come back to see us. We look forward to seeing you again! 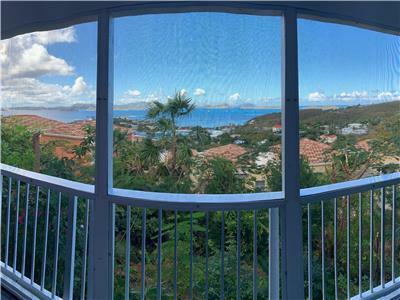 Fantastic views of Cruz Bay! My friend and I stayed in the one bedroom villa for 5 nights. We had everything we needed! Robert and Brittany were great! They were always available for anything we needed. Robert even gave us a ride to the beach one of our days without a Jeep. Our favorite time each day was sipping coffee and reading our books with the amazing view of Cruz Bay before we left each day. Although there is no A/C, we were comfortable at night with the fans. I would highly recommend this place to anyone. I also recommend that a jeep is rented for anyone staying here. Although it is a short walk into town, the hills are quite steep and the roads get slippery when wet. Thanks Daphne! It sounds as though your 5 night stay went well and that you enjoyed your time with us. Robert and I truly enjoy making sure our guests are well taken care of and we did not mind assisting you at all! Thanks for your recommendations for future guests regarding a rental Jeep - they are definitely the way to go and best way to see the island! We were glad to hear you were comfortable and happy and we hope to welcome you back very soon! I usually don't bother to babble on about lodging. A hotel is a hotel, etc. But this outfit is great. Quiet, perfect for St. John. Comfortable, simple, great views, terrific bathroom (I demand greatness in the shower). Nice people and everything worked. No TV. No radio. No idiots on water skis or ATV's running loose. Town is 24 seconds down the hill - island is 2 minutes to right and then up/down some hills that call for strong stomachs. St. John is still to top joint in the island chain and these people run a perfect place to drop - and stay. John, thanks for the review of your stay in the One Bedroom Suite at Sunset Serenade! We're so happy to hear how much you enjoyed the accommodations. It sounds as though you found the suite to be quiet, comfortable, and relaxing. We hope to host you at Island Abodes again soon! Our stay at Island Abodes was wonderful, and we're so grateful for the owner's flexibility with scheduling, etc. It made our stay so much more enjoyable. Our 1 bedroom apt. was very clean, and inviting. The view was excellent, and we loved the critters that hung about (outside). Very charming. Would definitely recommend this to friends. Thank you!! Thanks for sharing your feedback and for posting a review to Vrbo! It was no problem to be flexible with your schedule - that's what we're here for! We just want to ensure you have the best time during your stay with us and it sounds as though you truly enjoyed your stay. Thanks again for your review and recommendation. Please come back anytime! Our stay at Island Abodes was amazing! We ended up on St. John with no where to stay, as our arrangements had fallen through. We found a hotel for our first night but we needed a place for the rest of the week. I found Island Aboades on Homeaway and emailed Robert and Brittany at 5 am, by 7am Brittany had emailed us back! She was extremely helpful and made sure we got into a room that night. We loved the one bedroom apartment! The balcony has an amazing view of the bay and very comfortable chairs for watching the sunset. We had a kitchen with everything we needed to cook/grill, including a keurig for morning coffee. The bathroom has a cool screened in shower with a rain shower head that was very relaxing after a day at the beach. The apartment does not have A.C. but they give you plenty of fans and it was not uncomfortable or hot at all. We loved this apartment and Robert and Brittany were great! We will recommend Island Abodes to anyone! It was my pleasure to ensure you had a place to stay Rebecca! We know things happen and we do our best to stay available for our guests and assist with anything you may need! We were just happy to hear you enjoyed your stay with us and that you found the condo to be comfortable and well-equipped. Thank you for the review and recommendation and please don't hesitate to call us next time you need a place to stay on St. John! We'd love to have you. Loved it. Owners were flexible with us! My girlfriend and I arrived in St John and the directions were great to find your property. My girlfriend has been to the island in the past but this was my first experience. When we arrived Brittany met us and was extremely welcoming. The views from the balcony and the bedroom were an absolute delight to wake up to every morning. The location is fantastic for experiencing all that the island has to offer. We will be returning to the island hopefully soon and we will definitely be booking to stay in your one bedroom again. Thank you for your hospitality. You're most welcome Tracy! Robert and I enjoyed having you both, you were truly great guests! We can't thank you enough for taking the time to share your feedback and post a review, and we were so happy to hear you enjoyed the accommodations, including the views and convenient location . It sounds as though your first time to St. John was a success and we are so glad we were able to be a part of that! Thanks again and we'll see you soon for your second trip! Thanks for your review Amy! We were delighted to hear you and your husband enjoyed your stay and hope your friends did as well. We do our very best to make sure all of our guests have everything they could ever want or need, so we were happy to hear you felt so at home. We'd love to welcome you back so please let us know when you plan your next trip to St. John. Thank you again! My husband and I have been coming to SJ for a few years now, we are always impressed with the beautiful views that many properties offer and Island Abodes did not disappoint. Immediately upon arriving we were amazed at the beautiful, lush gardens surrounding this special property. We appreciated the close proximity to Cruz Bay as well. Entering the villa, we were blown away by the gorgeous views of Cruz bay and beyond. Every spare minute there was spent on the deck enjoying the iguanas and the views below. We also loved the unique, retro shower with rocks. The unit was well-equipped with all the amenities and comforts one would hope for while away from home. We highly recommend Island Abodes especially to anyone looking for a villa close to town, that provides many options for couples or families interested in staying together, yet having their own private unit. Thank you Brittany! We can't thank you enough for your review and recommendation for Island Abodes! We were so glad you chose to stay with us on this trip to St. John, as we know you had many beautiful options. It sounds as though you and your husband enjoyed many aspects of Sunset Serenade, and nothing makes us happier! Thank you again for your kind words and details regarding the property. We hope you'll consider staying with us next time you're on St. John either at Sunset Serenade or another one of our beautiful properties. Happy Holidays! We arrived on Sunday and were picked up graciously by one of the owners around 3:30. The property itself was beautiful with an incredible view and access to town only a short drive away. All week, every need was met including free Wi-Fi, an excellent working kitchen, Netflix and Hulu services that we did not use but had to option to at no extra charge, and showers with windows that provided an interesting but secluded view for utmost privacy. Our shower did not work the first day but the owners were extremely apologetic and fixed it immediately. Would recommend this house and any others for all people (adventurous and not.) Child friendly and inviting, this is the perfect place to take a secluded vacation from your home on the beautiful island of St. John. Thanks Abby! We appreciate you taking the time to share a review on VRBO. It was our pleasure to pick you up from the ferry dock! We try to be constantly available to our guests and want to do everything possible to ensure you have the best stay during your time on this beautiful little island! We were glad to hear you enjoyed the amenities that come with Sunset Serenade and again, we apologize for the initial inoperable shower. It sounds as though you guys truly enjoyed your stay and we'd love to host you again in the future. Thanks again and take care! I had the pleasure to meet both Brittany and Robert. The place is great! Clean and well equipped. They covered everything you could think of to make your stay comfortable. The view is amazing! I would definitely recommend having a vehicle to get to and from town as well as around the island. Planning, communicating and making arrangements for pick-up and drop-off at the docks with Brittany was a breeze. And the unit was great. It had most everything you would need. The deck had a wonderful view of Cruz Bay although since we spent a lot of time on the other side of the island in Coral Bay we didn't take full advantage of it. The unit was clean and spacious for two people and everything worked well. (could have used a couple more lamps or overhead lights with more wattage - e.g. it was difficult to read in bed before lights-out and another light over the sink area would have been a plus at night). Thanks Brittany! Thanks for taking the time to post a review on VRBO Ray! I was glad to hear that you found the entire process of staying with us a breeze, even before you arrived on our tiny island. It was my pleasure to assist you and ensure y'all had the best stay possible. Thanks for the suggestion regarding more lighting. Robert and I will certainly see what we can do about that and we appreciate your feedback so that we can continue to improve our units. It sounds as though you had a great time on St. John and in our One-bedroom and we look forward to welcoming you back for another visit in the future. Thanks again Ray! Hi again Nancy! And thanks so much for your great review regarding your recent stay with us. Robert and I were happy to help and always do our very best to ensure our guests feel comfortable and relaxed on St. John. Anything we can do to make your stay better, we will do it! It sounds as though you thoroughly enjoyed our spacious and clean one-bedroom unit, complete with a breathtaking view! Thanks for sharing the suggestion of renting a car with future guests. St. John has so many steep hills so it really is a great idea and we appreciate you mentioning it. We hope to welcome you back very soon. Thanks again for the review and the recommendation! Great place to stay on St. John! Island Abodes provided a great last minute accommodation for our stay in St. John. We had spent the previous four nights at a campground, so the comfortable bed, A/C and hot shower were just the relief we needed! Not to mention, we had a great view of Cruz Bay and St. Thomas and we were minutes from town. Thanks, Brittany, for being so hopeful and quick to respond to our request! Thanks for sharing your experience and posting a review Margaret! It was our pleasure to provide last minute accommodations for you. 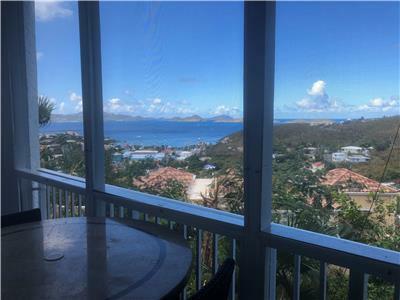 We were very glad you chose to come and stay with us and that we were able to ensure your last couple nights on St. John were comfortable and relaxing. We hope next time you vacation on St. John you'll stay at one of our Island Abodes properties the whole time! Thanks again and take care! Our stay at Sunset Serenade could not have been better. The location is a short drive from Cruz Bay with a great view of the town and St. Thomas in the distance. Day or night, it was a wonderful view (including the resident Iguana who perched in the tree about 30 feet from the balcony). The apartment was clean and comfortable with everything we needed. Plenty of towels and a terrific shower (almost like being out of doors), air-conditioning (which we never used), a nice kitchen (which we did use) and bag chairs and a cooler for the beach. There are a couple of groceries and a gas station on the way so supplies were easily had. I would highly recommend renting a car. The walk into town would not be pleasant. Brittany was very helpful. She offered to meet us when we arrived and gladly answered all of our many questions. I will say that the drive up from town is not for the timid but after a couple of trips it was no big deal and it made us appreciate the apartment even more. I will definitely recommend Sunset Serenade to our friends, as long it isn't for the same week we want to be there. Thanks so much for sharing your feedback Sue! We absolutely loved having you as guests and REALLY loved hearing that your stay with us could not have been better! We pride ourselves in ensuring our guests have everything they need and that they leave the island feeling more relaxed and content than ever! Thank you for your kind words regarding the location, the cleanliness and the view from the One bedroom suite. We also appreciate your suggestion to rent a car, as we too always recommend our guests do so. It's the best way to get the most out of the island every day! Thank you again and we look forward to welcoming you (and all your friends) in the near future :) Take care! It was a memorable trip. Our first time to St John. Our host - Brittany was great, She picked us up in town and guided us to the one bedroom apartment before our 4 pm checkin time.We would have never found it on our own!! The view from the balcony and our bedroom was amazing. The apt was very clean and well equipped. The kitchen was well stocked, even had a Keurig coffee machine. I loved the shower with its loose pebble flooring. She did not miss a thing. We had beach towels, beach chairs, cooler, bug spray, umbrella and even some snack bars to take with us on our outings. We made good use of the Roku ( with subscription), watched a few movies at night. Brittany was always a phone call away if we needed any assistance. I would highly recommend this apt to anyone visiting St John. Thank you so much for posting a review on VRBO! Robert and I loved having you both as guests and were so glad to hear that you enjoyed both your first trip to St. John and also your stay with us at Island Abodes. We were pleased to hear that the apartment and the amenities exceeded your expectations. Thank you again for taking the time to share your feedback and leave such a great review. It was our pleasure to ensure you were well taken care of. We hope to welcome you back to the island very soon and would love to have you anytime! Best views of Cruz Bay! This stay was wonderful! I've never before "looked forward" to getting back to the place we stay during our vacations but this was the exception. The views and the amazing deck were fantastic! The deck is very private and much larger than expected, perfect place for our breakfast every morning. My hubby even napped on the daybed while I got ready for the evening. The bed was very comfortable and I really liked the shower-feels as if your outside but still very private. Very clean and tradewinds were perfect during our stay. We never used the A/C. Called Brittany when we got our Jeep and she gave us directions and met us there. The place is landscaped very nicely and even grilled steaks one evening. If we revisit St John in the future I would plan to stay at this place again. Thanks Brittany for making out visit to St. John so memorable! Many thanks for your awesome review Cindy! We enjoyed having you both and I loved nothing more than to hear that you're looking forward to your next stay with us! Thank you for your details regarding the One-Bedroom Suite and all of things you enjoyed about it. It was absolutely no problem for me to meet you at the car rental and to make sure your entire stay was just perfect! We want to ensure you come back to our little island, and we want to do our best to make sure you want to stay at Island Abodes. Thanks again for posting this Cindy, we appreciate it so much and can't wait to welcome you back! We had a great experience! We stayed in Brittany and Robert's one bedroom apartment, and it was perfect for the two of us! The view was beautiful, the apartment was clean, the bed was very comfy, and the customer service was absolutely outstanding. Before we left, Brittany responded to my email questions within the hour, and offered several options for us to choose from to make it easiest for us to find the apartment. She even offered to meet us at the ferry to caravan over. We elected to find it on our own as we wanted to grab some groceries and weren't sure when we'd be ready. We found it with little trouble using Robert and Brittany 's directions - in the dark no less! We walked in to a basket full of snacks, a couple bottles of the local beer, and a kitchen with all the gadgets and appliances you'd need to cook whatever you want. SO welcoming! There were also plenty of linens, a cooler, chairs (these are the fold up nylon lawn chairs in a bag rather than beach chairs), maps and island info, and even a selection of books in the front closet! We rented a jeep and were glad we did as the roads are steeply hilled. For evenings out, I'd recommend parking in Mongoose Junction and strolling Wherever you want to go. Be patient, parking is a little tough to find during the evening. I loved St John and I'd definitely recommend Brittany and Robert's home for accommodation! Thank you so much for your review Kristi! You guys were great guests who left the One-bedroom Suite clean and tidy upon your departure... we really enjoyed having you! It sounds like you enjoyed your stay, especially the view, clean accommodations, and comfortable bed. We're so glad you felt well taken care of, that you were able to find the place so well (in the dark!) and that you enjoyed the welcome goodies we left for you. Thank you for providing details about the amenities provided and for the helpful parking hints. Future guests will surely appreciate your feedback and we can't thank you enough! We hope to welcome you back in the future... we'd love to provide you with another great stay that exceeds your expectations! Best Caribbean vacation I've ever had! I loved staying here and the owners, Robert and Brittany, are amazing. When we landed on St. John, we picked up our rented jeep and followed Brittany's directions right to the Suite. Once we arrived, Robert was waiting there to show us around, see if we needed anything, and answered all our questions about things to do and where to go. Our first view when we walked in was so beautiful. 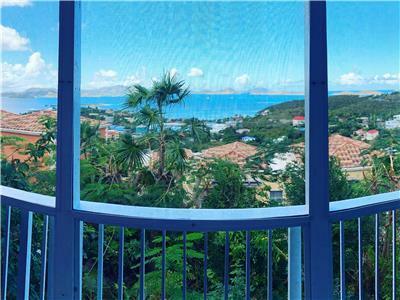 You walk in and all you see is this wide open view of Cruz Bay and across the water to St. Thomas. The deck had a table, a couple chairs, and a daybed that made enjoying the view and air simple and comfortable. We ate breakfast out there most days and watched the sunset most nights. We also got a nice view most days of our "neighbors", a tree of iguanas off to the side of the house. It was fun to see them sunning and they never left their tree so they weren't a nuisance. There was plenty of room for my mom and I with the queen bed in the bedroom and a sleeper sofa. The bedroom had an AC unit in it that was nice to turn on low to go with the fan on the warmer nights. St. John is beautiful and it is more relaxed and less crowded than what I was expecting after being on St. Thomas. We went to town to eat once a day and just walked around because it was easy to get to most everything. A majority of the beaches are easy to get to since they are all along the same road. We went snorkeling several days and got to see everything from colorful interesting fish in the reefs, to stingrays and sea turtles. Brittany and Robert were always available to answer any questions or help out in any way to make sure we fully enjoyed our vacation. I've never been a big fan of Carribean vacations because of all the stress and hastle, but I am already planning on returning the next time I get a chance! Thank you for posting a review Leigh! It's so awesome that both you and your mom took the time to leave such great feedback for us and for future guests. We really appreciate you both. It sounds as though you guys thoroughly enjoyed the island and your stay with us, and nothing makes us happier! We do our very best to ensure our guests are comfortable, relaxed, and have everything they need, so it was awesome to hear that you enjoyed your stay so much, despite not normally being a "Caribbean vacation" kind of girl. We hope we've changed your mind permanently and that you'll continue to come back to St. John. It's our favorite place in the world and we love to share that with our guests. Thanks again Leigh, we hope to welcome you and your Mom back in the near future. Maybe next time you can try a different Island Abodes property, or even bring the whole family :) Take care! This experience was so wonderful that I can't wait to go back! Brittany recommended that we rent a jeep for the week. Excellent advice! Made it to islandabodes without any trouble following Brittany's directions. Robert met us and showed us around and gave us great information about the beaches, restaurants, and shopping. The one-bedroom apartment was very clean, nice, and equipped with anything we might need for our weeks stay (fully-equipped kitchen, linens, bug spray, beach chairs, cooler, umbrella, snacks, etc.). The screened patio door and windows allowed for a continuous wonderful breeze. Loved the open feel of the shower with the tile and pebbles. It was great to be able to wash the sand off us and our things outside our door before going in. Now for the best part - the amazing view of Cruz Bay and St. Thomas! The clear blue waters, sail boats resting in the bay, and boats/ferries coming and going, it never got old. It was an easy ride to town for restuarants and shopping. It was also an easy ride to all the north shore beaches. Our snorkeling experience was at Hawksnest for coral and stingrays and at Maho Bay for sea turtles and stingrays. This was our first snorkeling experience ever and it was amazing. Everyone we met was friendly and helpful. I can't thank Brittany and Robert enough for a wonderful vacation. I would highly recommend islandabodes and will certainly stay there again for any future trips to St. John. Hi again Mary! 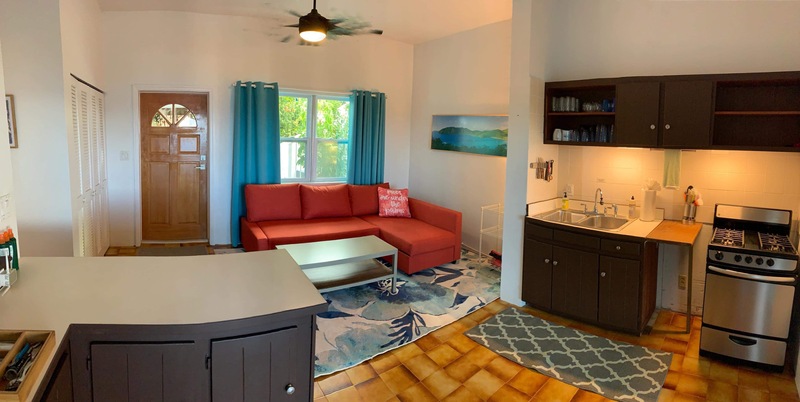 Thank you for sharing your experience at Island Abodes and for taking the time to post it on VRBO! Robert and I were pleased to have you and your daughter as our guests, you guys were so great. And it sounds as though you both had a wonderful time on St. John and really made the most of your vacation. I'm glad our advice to rent a Jeep paid off.. we just think that's the best (and most affordable) way to get the most out of the island on a daily basis! Just think, you may have missed some of those turtles and stingrays without your own set of wheels :) Thank you again for your review, your recommendation, your kind words. We look forward to your return and will do our very best to ensure you have another great stay! I can't say enough good things about this rental! I could have stayed on the large patio 90% of the stay and have been happy, but the rest of the unit was just as special. The bed was very comfortable, the shower felt like an experience, and the thought out details throughout the unit made this a place I will return to again if I revisit St John. 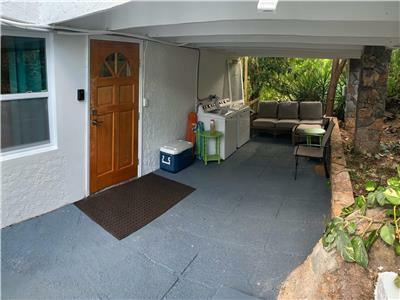 It's an excellent value for your money and I highly recommend staying in this unit and enjoying a sunset from the patio! I could move in! Awesome place to stay! Thanks so much Karen! Robert and I can't thank you enough for your great review, kind words, and five stars! We loved reading that you enjoyed your stay with us at Island Abodes and that our beautiful One Bedroom Suite exceeded your expectations! Thank you for appreciating the little touches, cleanliness, and surrounding garden views. We look forward to having you back and you know you're welcome anytime. Thanks again! Great 1 bedroom unit . Nothing to complain about and I don't see how it could've been made any better. Very clean, comfortable bed, great deck, and front area for hanging out. Nice gardens. Easy access. Everything was in great condition. Cooler, chairs, towels, beach mat...made everything so easy. Coffee machine and Keurig. Really cool shower...almost like an outdoor shower. Never had that icky feeling that one can sometimes have when staying in an Airbnb or mediocre hotel/motel. Owners are highly receptive and friendly and it's clear that they take great care of their properties and want their guests to have the most enjoyable experience possible. I wouldn't hesitate renting from Island Abodes again. Thanks so much Douglas! We loved reading that you had a great stay, and that you enjoyed the One Bedroom Suite. We appreciate your feedback regarding the condition of the property and the service and amenities provided to you. We're glad we didn't give you that icky feeling, and we'd love to have you back anytime! Thanks again! Learn More In Our Blog! Awesome place with very thoughtful amenities. fantastic experience!!!!! five stars! absolutely recommend and we will return! Couldn’t recommend staying here more! Had the best of times and Brittany couldn’t have been more accommodating. Island Abodes, LLC. All Rights Reserved.